C. Teijeiro Barjas, T. Hammerschmidt, B. Seiser, R. Drautz, G. Sutmann. Illustration of computations that are required for analytic bond-order potentials for different fractions of bulk atoms and surface atoms in a two-dimensional sample system. The modeling of materials at the atomistic level with interatomic potentials requires a reliable description of different bonding situations and relevant system properties. For this purpose, analytic bond-order potentials (BOPs) provide a systematic and robust approximation to density functional theory (DFT) and tight binding (TB) calculations at reasonable computational cost. 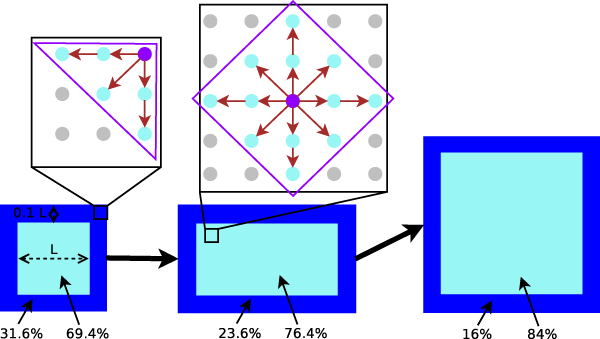 This paper presents a formal analysis of the computational complexity of analytic BOP simulations, based on a detailed assessment of the most computationally intensive parts. Different implementation algorithms are presented alongside with optimizations for efficient numerical processing. The theoretical complexity study is complemented by systematic benchmarks of the scalability of the algorithms with increasing system size and accuracy level of the BOP approximation. Both approaches demonstrate that the computation of atomic forces in analytic BOPs can be performed with a similar scaling as the computation of atomic energies.